Just as helmets are essential to protect an athlete from head trauma, mouthguards are absolutely necessary to prevent damage to the teeth during sports. 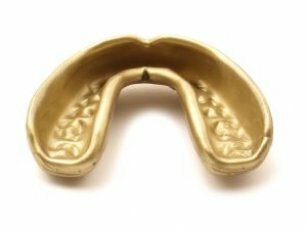 No athlete, no matter their age, should be without a mouthguard for any sport which could cause impact to the head and face. Modern appliances are extremely comfortable and custom-fit to each patient. The protection they provide is important, as teeth can be permanently damaged or even knocked out entirely in many sports. Store-bought mouthgaurds can be bulky and uncomfortable, and many young people refuse to wear them because of their fit. A custom mouthguard, now much more affordable and innovative, is easy to get—just see us at Downtown Dental Services.